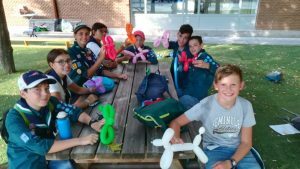 After a long summer break, the Scouts returned to their activities at St. George´s International School, where the different sections met their new leaders and assistants after the summer reorganiztion. Our first September meeting got off to a great start with three new beavers joining the group and two new leaders. The focus of the meeting was to get to know each other and work on the Outdoors and Teamwork challenge awards. 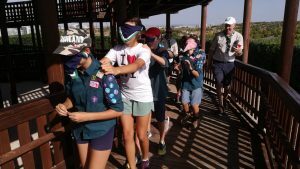 The teamwork activities were based around games where cooperation was needed so we played “pen in the bottle” which was run by the Young leaders and “squirrel and fox” which was enjoyed by all and requested by the beavers at the next meeting. In terms of first aid we covered minor cuts and all the beavers had a go using facepaints to pretend, this worked out great when Ana took a tumble and needed a plaster which the beavers sorted out without needing any help. We would also like to say a special thanks to Katherine, Sarah and Rebecca along with the mums and dad’s who came along to join in as well. 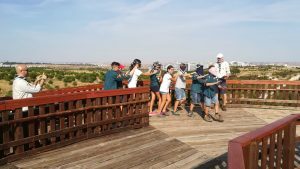 The scouts have been divided into two troops today, for the activities. First, they went walking to Felipe VI Park. They had to find their way to get there with their compass and a map with no street names on it. The winner was the first group to reach the top of the “Mirador de Felipe VI”. They all made it in an accurate time, despite the hot weather and the sun over our heads. Once in the scenic lookout, and after the snack, we played “blind worms”. Each worm composed by a troop formed in line, one behind the other. All with their eyes shut, except for the last one, which had to lead the head of the worm without talking. The first troop to reach the upper part of the scenic lookout was the winner. The next activity was to learn how to locate (find) oneself in a map, using a compass and triangulation procedures. They had to find themselves in the map of the park using this procedure. Finally, we walked back to the headquarters while learning how to make a doggy with a balloon (balloon twisting).